Cutting-edge strategies that make you stand out in the crowd--in person, online and everywhere else In a grim job market, job-seekers need to use every tool at their disposal to find the right position. 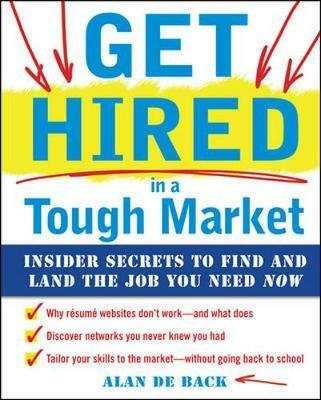 From the pre-work that gets you off on the right foot, through attacking the job market on all fronts, to the interviewing and negotiation process, Alan De Back reveals the secrets to getting hired fast in a changing marketplace. Find out why resume websites don't work; how to use social networks so your efforts won't backfire; and where to look for contacts you didn't even know you had. 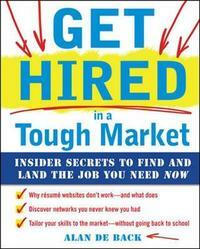 Get Hired in a Tough Market is full of interactive tools and assessments that readers can tailor to their individual situations. Alan De Back has over 20 years' experience as a career counselor and trainer in the corporate, academic, and government arenas. His clients include the American Management Association, the American Psychological Association, the Department of Defense and the Virginia Employment Commission.